I love the way that this fabric is organized! I would need a much larger closet, though. I was dying to buy fabric last week, so I washed some of the Great Unwashed and that helped to make me feel like I had some new pretties to pet. Ruler Recall: Marsha McCloskey sells rulers on her site that make cutting and sewing her Feathered Star blocks easier. She wrote about the ruler recall in her most recent newsletter: “Recently, I learned, much to my dismay, that my last shipment of Precision Trimmer 3 rulers contained defective rulers. Truly, I didn’t know. Rulersmith has produced perfect rulers for me for 15 years. When these rulers were delivered in February 2014, I didn’t check them. My Mom had just passed away and my mind was not on quality control. The ruler problem is in the placement of the locator hole at the ¼” seam allowance at the corner of the ruler. This hole is used to locate the start and stop point for set-in seams. On the defective rulers, the hole is placed slightly to the right. Not acceptable. I have no idea if all the rulers sold in the last year were made this way or only a portion. Rulersmith has replaced the entire print run with accurate rulers and I will replace your ruler if it is defective. I will be contacting people who bought the PT3 ruler through my website, but I have no way to identify who might have bought a PT3 from a shop or from me in a class. You will need to identify yourself, so I can replace the defective ruler with a good one. Please, go to the special PT3 RECALL page on my website and follow the directions if you want your ruler replaced. There is a special page for this issue. You can now use PayPal on her site and a lot of her fabrics are on sale for $6/yard. These notebooks are clever and creative. I love them except for the part about kids using them in school! Are you a Frixon pens fan? I found a new product that provides another use for those pens. “Rocketbook, designed by startup Rocket Innovations, looks and feels like a traditional paper notebook and pen combination, but it uses heat-sensitive ink and is paired with a smart app. (The pens, FriXion ballpoints by Pilot, are cheap and easy to find at places like Staples.) When you stick the 8.5-inch-by-11-inch notebook in the microwave for 30 seconds, all 100 of its pages are cleared, so it’s infinitely reusable. Its paper features a dot grid pattern that makes it a good sketchbook for designers, typographers, and architects. Before you erase your most brilliant doodles, Rocketbook will convert them into digital documents. Lots of artists and designers find sketching by hand, not just on the computer, a crucial part of the creative process, but scanning can be a pain. When you want to save your writing or sketches, the Rocketbook app will upload them to the cloud. The app takes photos of the notebook, two pages at a time, and automatically sends these digitized documents to folders in your Google Drive, Dropbox, Evernote, or email account. Seven icon buttons are on the bottom of each page, and you can assign them to various locations to determine where the document will be sent. 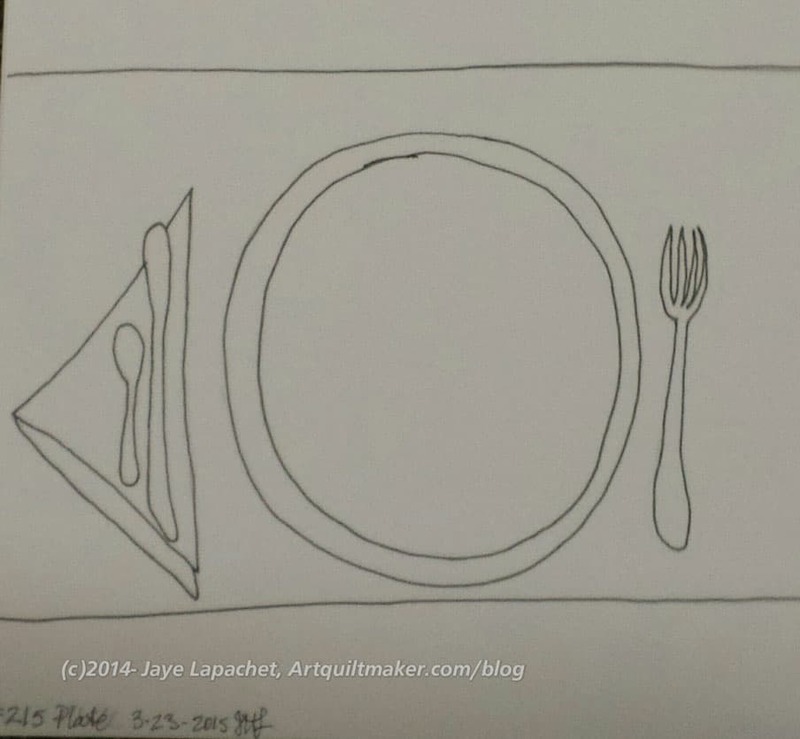 For example, pressing the airplane button might automatically send your pages to Evernote.” Interesting idea for your quilt sketches and notes to self. This is a very short article about the Missouri Star Quilt Company without a lot of details. It leaves me wanting more. Where did they live in California? When did MSQC start? Perhaps, it will spur others (DO YOU HEAR PODCASTERS???) on to find out more. Jackie is starting a series on sewing with children on her blog. She has posted random bits about sewing with children so I am looking forward to this organized series. Modern Quilts Illustrated issue #10 is available. Weeks Ringle and Bill Kerr at the Modern Quilt Studio have gone to a 2x/year publication schedule. There are no more subscriptions, but you can order it on their website. 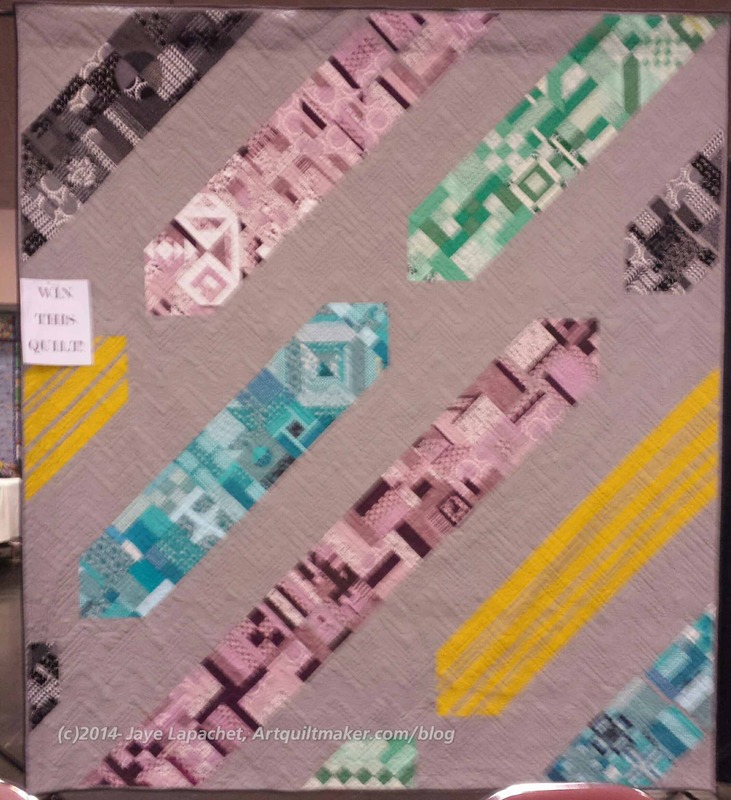 The International Quilt Study Center quilt of the month is Oil Rigg by Jo Budd. We all receive poorly written, flame sounding emails. Sometimes I can’t believe the email I receive because the writer sounds so angry just because s/he signed up to receive a notice of my blog posts. Ms. Lottie, who has the fabulous NZ based podcast and blog, posted a reminder from another artist, Dena Crain, about some tricks on how to avoid and respond to less than clam emails. One thing that spoke to me was the paragraph “Truly, our success at accomplishing all of our life goals has to do with how we approach other people. Give everyone the benefit of the doubt, and trust that most people really do want to do the right thing, even you!” Dena also has a tutorial on making a mosquito netting. I think that is the first tutorial of that kind I have seen. Ms. Lottie also has an interview with Sue Benner on her most recent podcast. The Metropolitan Museum of Art has put up 4000 high resolution art images and made them available for certain uses. The LA County Museum has done this in the past, so I hope the practice will be a continuing trend. How will they inspire YOU? The Home Machine Quilting Show will be in Salt Lake City May 7-9, 2015. Charlotte of the Slightly Mad Quilt Lady Blog and Podcast has a tutorial on tying a knot for hand sewing. The thing I like about this tutorial is that it is short, gets down to business right away, tells you what you need to know and doesn’t have a lot of distractions. Philippa, AKA OzzyPip has been posting a series of animal blocks to Twitter. I love this little bird. I know you NEED a cactus pin cushion. 😉 I saw a pattern posted on the Sewing Lab blog and thought you would like it. I know you could make some creative changes to put your own mark on it. If you make one, post a picture to the AQ Facebook page. I’d love to see your work. I was excited to see the Bag of the Month club bag over at Sew Sweetness. It is almost the perfect bag. The Hyacinth Bag is great for a purse and place to store a few things you might need at a quilt show. It is almost the perfect work bag for me, but just a tad bit too small. Still, she is getting closer. 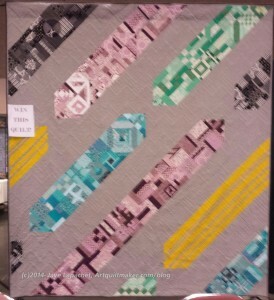 I love the use of text fabrics in the quilt by Magnolia by the Bay. I know that the New Year is long in the past, but I came across this 2014 Year in Review by Sara over at Sew Sweetness. The visuals add interest. I really like the gallery of photos and will see about doing some similar at the end of this year. I love the apron her friend is wearing towards the end of the post and I do kind of like that Rockstar Bag. I didn’t see it when it came out and I’ll have go and check it out. It has possibilities for a “take my stuff and lunch to work on the train” bag. You might see one that I made pretty soon. We’ll see. Alex Veronelli retweeted a photo of Karolina Bakowska’s thread doodling piece. It is fantastic and I love it! I haven’t seen anything quite like it, but it really looks great. Take a look at a short video with a Libby Lehman update. I am still hoping she will be able to teach again. How did you celebrate Pi Day. Take a look at this great quilt. 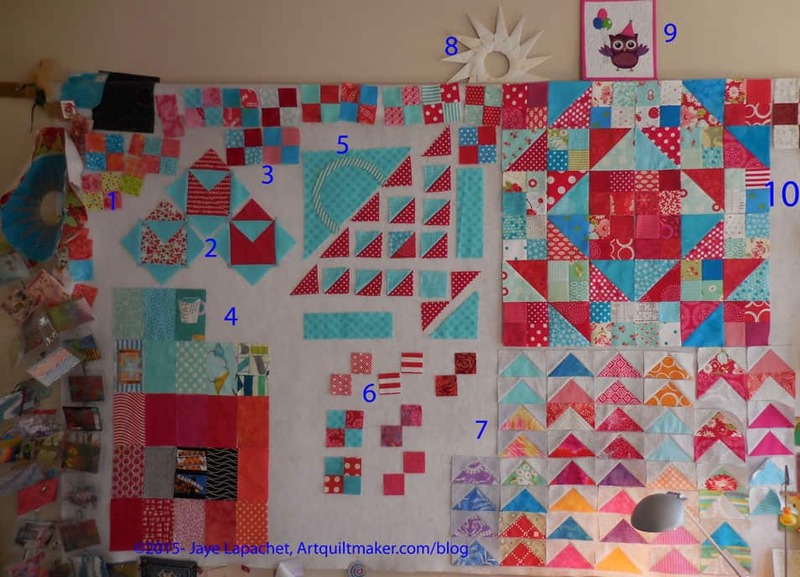 My mom put up a new blog post with brief mentions of 3, yes THREE, finished quilts. Amazing! 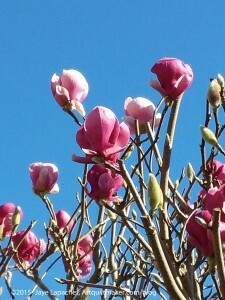 There will be a workshop on Saturday at the CQFA meeting based around this photo, Spring Comes to Humboldt. The name of the workshop is the “Same Design, Make it Mine” challenge. 1. 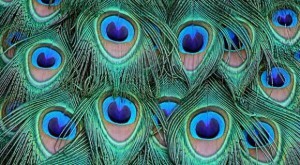 Look at the photo and recreate the sense of it in your medium of choice. CQFA Members: bring materials and supplies to the meeting as we will work on our own projects during the meeting. While this workshop is primarily set up for CQFA and will be held at the meeting, everyone who reads is welcome to play. You can post your efforts to the AQ Flickr Group, or the CQFA Flickr Group, if you are a member. 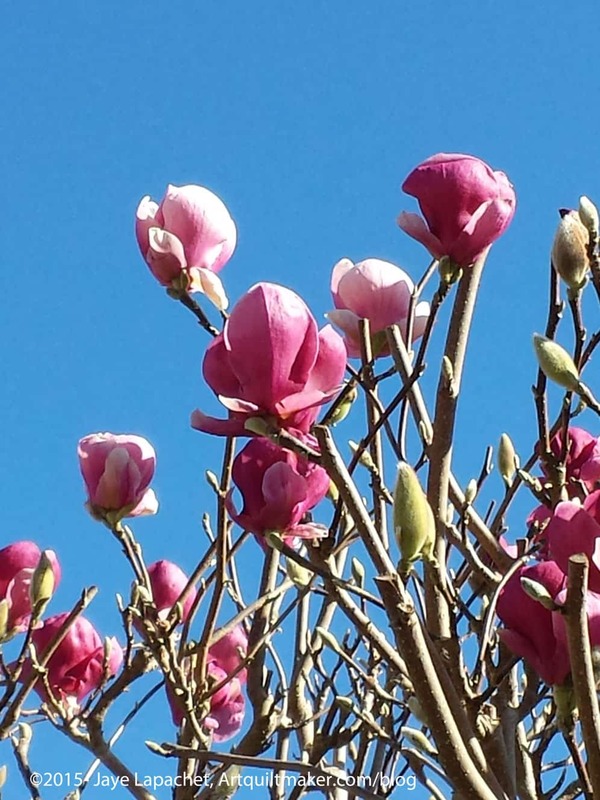 <Nota bene: you can easily be a member for a small payment of dues!> CQFA members should bring their finished or in process works to an upcoming meeting. There are a number of things about this book that do not fit into my definition of a perfect book, but I like it anyway. I like the colors on the cover. They are cheerful and drew me in. The colors of the projects pictured in the book are fresh and also cheerful. I also like the fact that Kim Brackett admits that “not all fabrics work well together in a scrap quilt.” Hallelujah. Some authors insist a maker can put anything into a project and end up with a beautiful quilt. I simply do not agree. I find that seeing the words in print make me feel validated. This book talks about using 2.5″ strips and pre-cuts. I don’t, usually, buy pre-cuts, but I have a ruler and a rotary cutter and have the ability to cut as many 2.5″ strips and squares as I want to make these quilts. After a short introduction, the author provides into a lot of information about 2.5″ strips. The bottom line is that the reader does not have to buy pre-cuts; s/he has to have fabric and scraps. From those s/he can make the quilts in this book. Hard on the heels of the 2.5″ strip section is the ubiquitous ‘Basic Quiltmaking Instructions (pg. 11).’ The information found in this section is basic and, mostly, a review. Still, it is always useful to be reminded how to avoid cutting a V in a fabric strip. 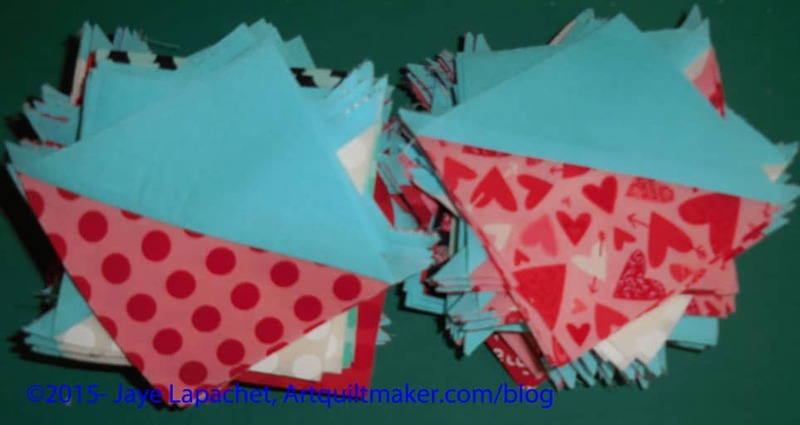 Aside from the normal “how to sew a quilt together’, this section also includes a little about chain piecing and Folded-Corner Units (like Flying Geese). There are charts to fill in on creating Side-Border Strips and Top- and Bottom-Border Strips. Quilt patterns start on pg. 20 with a peach confection called Sanctuary. This is primarily made with four patches within four patches. The patterns could do with alternate color ways on the last page of the pattern to spread the wealth of the information. Scrap-Basket Trail is one of those quilts that would appeal to many more people if the brown and reproduction backgrounds were removed and the quilt was shown in, say, pinks. Cross My Heart (pg.30) looks really great in various Bonnie & Camille fabrics. 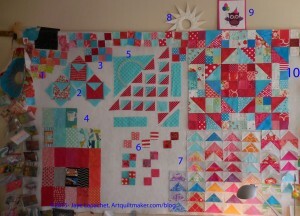 Hourglass (pg.36) is bright and cheerful and pretty interesting in the piecing department. Almost all of the patterns have something intriguing about them. One of my favorite patterns is Beachside Bungalow. I love the rings and the colors. I also like the grey used in the background. My absolute favorite pattern, which I intend to make…sometime, is the Triple Star. some of its charm comes from the scrappiness, but it is also an interesting block with a lot of pieces. I also really like the blue background. No index and a brief table of contents. Yes. 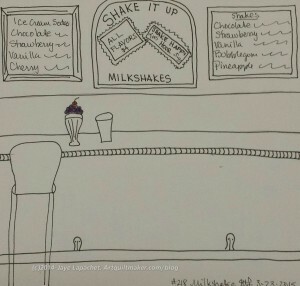 And I felt stupid posting that prompt, but thinking about milkshakes and what the word meant to me was awesome. 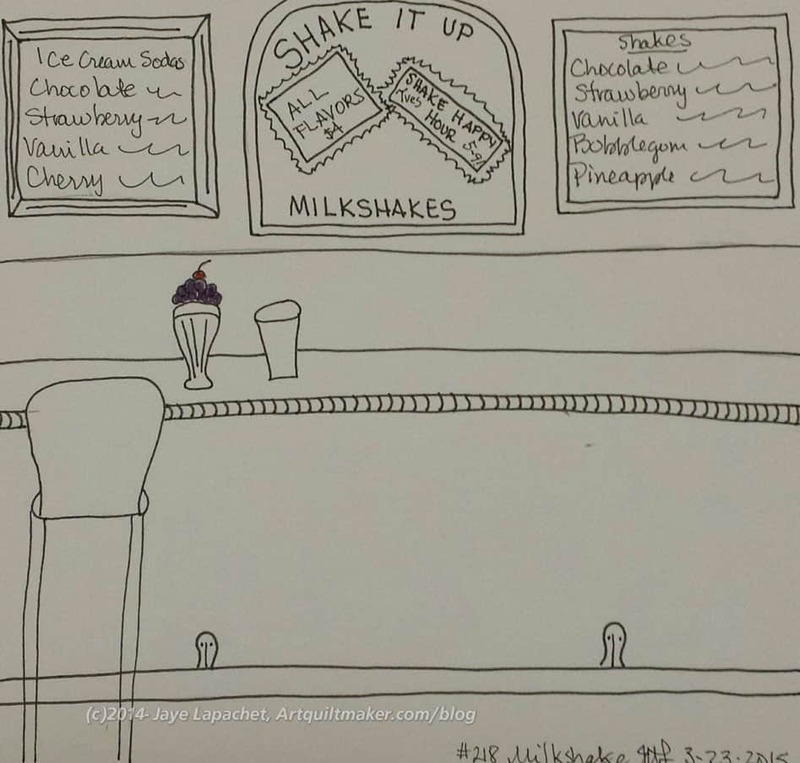 This response was inspired by, not only milkshakes, but also prompt #208. Sadly, that is one of the lost boys and you can’t go back to see the response. Yet. Again, librarian drama. I like this response. I was finally getting my drawing groove on. It is more complicated than the other prompts drawn in the same session. How about you? Want to join in the fun? Don’t copy! Draw, color, paint, dance or sing your own response. Take a look at the original prompt to be inspired. 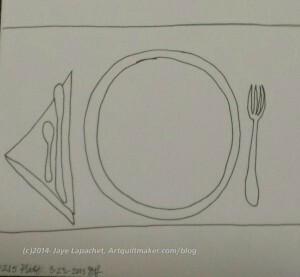 Then, post the direct URL (link) where your drawing, doodle, artwork is posted (e.g. your blog, Flickr) in the comments area of this post. 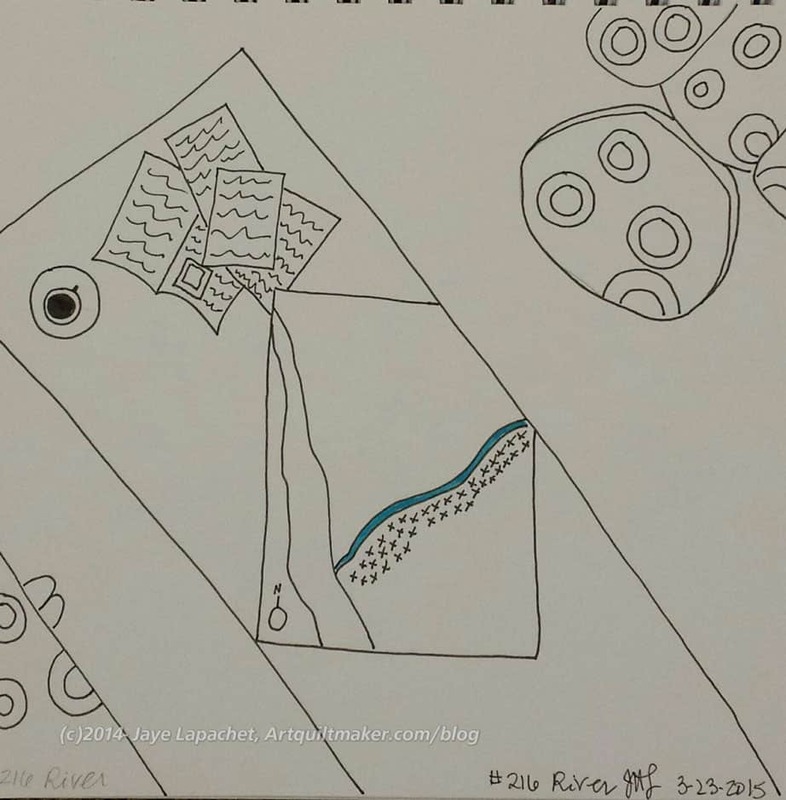 I would really like to keep all the artwork together and provide a way for others to see your work and/or your blog. What else could it be but a fountain pen? Have you used a fountain pen? I have. They are an experience. They create individual words – well, the act of using a fountain pen is a creative experience that makes the words look individual. It is a terrible or wonderful experience. Terrible if you run out of ink or your cartridge malfunctions and you get ink all over your hands, paper, desk….you get the idea. Wonderful if your pen flows beautifully. 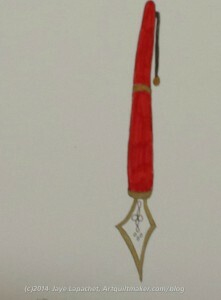 I have a couple of fountain pens, but none that are scarlet and gold. I do have cartridges with turquoise and emerald ink. I see fountain pens on MassDrop all the time, so they must be coming back into fashion. I am thinking about picking up a fountain pen again just to see how rosy my memory of using one is. This drawing is a little bit simple, but I was bold with the color. Take a look at the original prompt. Then draw, color, paint, dance or sing your own response. Be inspired. I did four drawings in one hour. Four responses in one hour. Even in that short amount of time I saw progress and I felt more confidence the more I drew. The first one I drew and the last one posted is very simple, but I found that it got my feet wet. 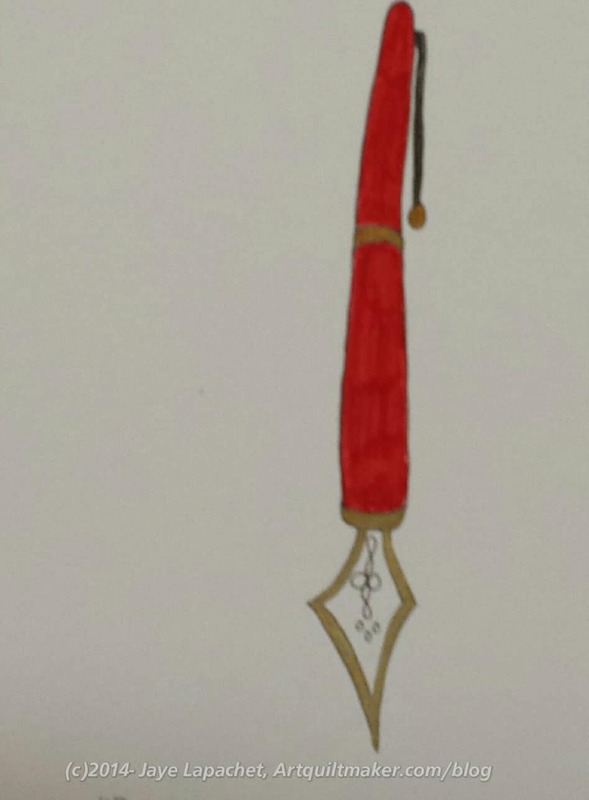 I also got inspiration, and continued a series of sorts, by looking back at my previous drawings. My confidence was better, but I also penciled in some of the major lines just to get the proportions, mostly, correct. Take a look at the original prompt. Draw, color, paint, dance or sing your own response. Take a look at the original prompt to be inspired. There is good and bad with the posting of, finally, another prompt response. The Good: I am drawing again. I am responding to prompts again. I am enjoying responding to the prompts. I am enjoying using my pens and paper. I did draw a response (and post it) in 2014! The Bad: This one isn’t that good and pretty basic. I haven’t posted a response since April of last year. What is making me a little crazy is that the last one I posted was #204 and this one is #215. There are 11 I didn’t post and now the posts will be out of order. I may add the posts later in order. This is librarian drama. Still, a person has to start somewhere. I am pleased to say that I am taking my own advice and I only spent about 5 minutes on the drawing. I don’t hate it, but it does need something. If I add it, I’ll post again. Have you seen the original prompt? 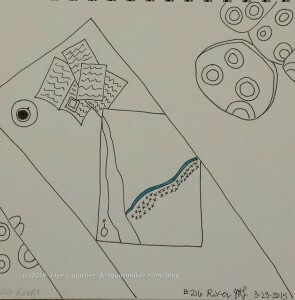 Take a look at it and draw, color, paint, knit, sew, dance or sing your own response. Action Hooks allow you to add your own code to WHMCS that runs when specific events or actions occur inside the system. Hook partners with leading advertising agencies to design and develop spectacular interactive ad content for desktops and mobile devices. 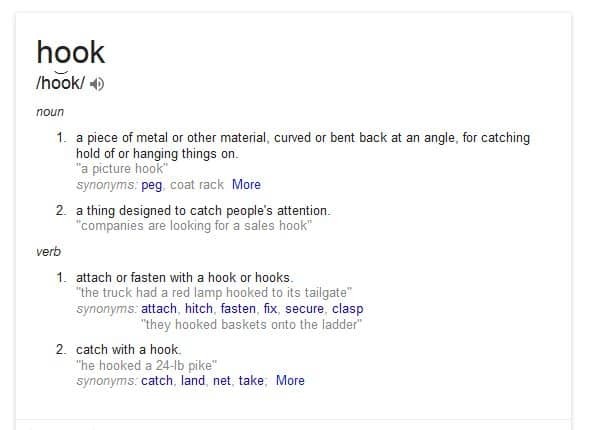 Git Hooks. Like many other Version Control Systems, Git has a way to fire off custom scripts when certain important actions occur. Hook Mobile SMS API provides cost effective messaging solution for user acquisition. Redmine supports the concept of Hooks. It is an API to allow external code to extend the core Redmine functionality in a clean way. At hook’s cheese company, Tony and Julie Hook have been making Wisconsin cheese for over 35 years. 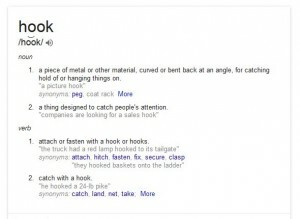 A hook is a mechanism by which an application can intercept events, such as messages, mouse actions, and keystrokes. I heard a Wilco song recently called Box Full of Letters and thought that would be a better name for my version of the Missouri Star Quilt Company pattern, Love Notes. Love Notes is a nice name for a cutesy quilt, but I didn’t want to make a cute Valentine’s Day quilt. I just wanted to try out the pattern and see how it worked. I have been sewing the squares and cutting them into half square triangles. I have used the Kiss Kiss charm squares that Torie gave me, but am also adding other fabrics that work well with that charm pack. The stacks in the photo will make about 20 blocks. I found a few more that had fallen down on top of the Stepping Stones fabrics. There is quite a lot of red in these blocks and I need to add some other colors to the group, but first, I am going to sew these blocks together and see what I have. The blue solid background may make it less sweet. There is a fabric with a black background and pink dots (I think) of which I would like more. The bottom line is that I need to see how the blocks look. I haven’t sewn any blocks yet, but stay tuned for that. Sadly when quilt shows are put up they cannot stay up forever. 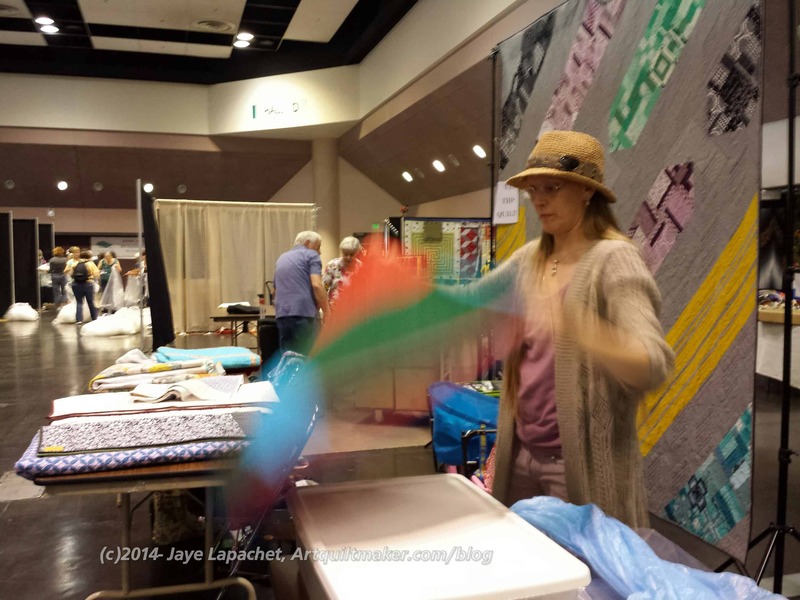 I happened to still be at the Santa Clara Valley Quilt Association quilt show when it closed on the 15th. I stayed around and helped to wrangle the BAMQG quilts that were coming down. I thought we would be able to help with other quilts, but we kind of had to guard the BAMQG quilts. Helpful people kept coming by and trying to take away our quilts and put them with the other quilts to be picked up. While we were on guard duty, we took down the opportunity quilt, put the stand in its fancy bag, rolled up the BAMQG banner and put away the display quilts. The opportunity quilt* is beautiful and very unusual. Ruth designed it and Marci quilted it. The photo is just a cell phone photo and doesn’t really do it justice. As mentioned, many of us made blocks and a bunch of us bound it. It was truly a group effort. I was pleased to be able to help out at the show. I don’t think I had taken down a quilt show before. *tickets have to be bought at a show. Email me if you want to discuss getting one. I had to go deposit some checks the other day. Since I was walking I stopped by the library and borrowed the One Block Wonders book. I started reading it before I went to bed the other night and I am less sure about the project. First, the original panel I was thinking of using probably won’t work, because it has too much white in the background. I found the fabric on the site called Melinda’s Fabric Shop. I never used that shop before and they have quite a bit of variety as well as a good layout on their pages. Since the site had related prints right on the screen showing the panels, I looked through the other prints in the line and there are some others that might work for this project. I like the squares print that looks like tile (Wilmington Majestic Beauties Tiles, #F6898), but that print, according to the book might also not work because there is not enough variety in the colors and shapes. 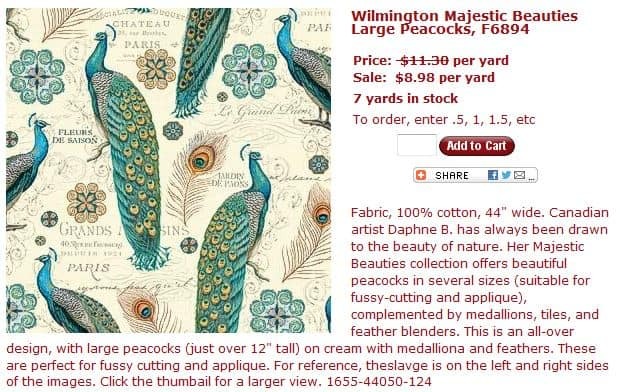 I kept looking and found another print with the peacocks that has more variety in the design and not as much white in the background. It also incorporates some single feathers and the tile. The heads of the birds are a smaller part of the design, which is also kind of a relief, because I really don’t want heads in many, if any, quilts that I make. The concern I have with this print is the size of the repeat. I can’t tell from the website so I sent them a message. The book says that there will be too many duplicates if the repeat is too small. I still haven’t looked through my large pieces of Philip Jacobs fabric, but need to do that before I go out and buy more fabric. I was pretty excited seeing Pam’s version, but as I read the book, I am less excited. I am not thrilled about sewing more hexagons together either. Been there done that. The whole project just seems a lot less interesting after reading the book. Perhaps that is what I felt when the book first came out. I haven’t done a post like this in a long time. A long time is about a month and a half. i wonder if it looks much different from my last post? You tell me. Hot four patches. I want to make some kind of four patch quilt out of hot colors. This is a long term project that I am thinking about. It just came to the fore recently. Love Notes quilt: this is a Missouri Star Quilt Company pattern. Someone told me it was boring, but I decided to make it anyway. I object to the bias edges, but there is something about it that I like. Perhaps the envelopes making people think of writing. I am not going to call it Love Notes. Look for a more comprehensive post later. Red & turquoise four patches. FOTY 2014 Patches: I have decided that this is the last batch of the FOTY 2014 patches. Sampler quilt basket block in progress. I haven’t done more about the tutorial, but, see Frances, it is in process. Red & turquoise four patches in progress. Flying Geese project: TFQ and I are exchanging Flying Geese and these are the ones I have made and received so far. Folded paper star: I made this with a friend and really wish I could remember how to make it. If you know, let me know. Each leg is made from a square piece of paper. My birthday card from the Crafty Garden Mom. Four Stepping Stones blocks. 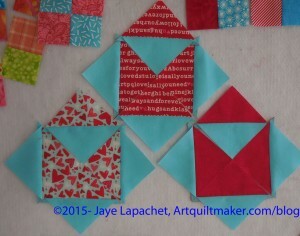 I have a stack of fabric and various parts of blocks, but I haven’t made any new ones yet. No room on the design wall for another project. 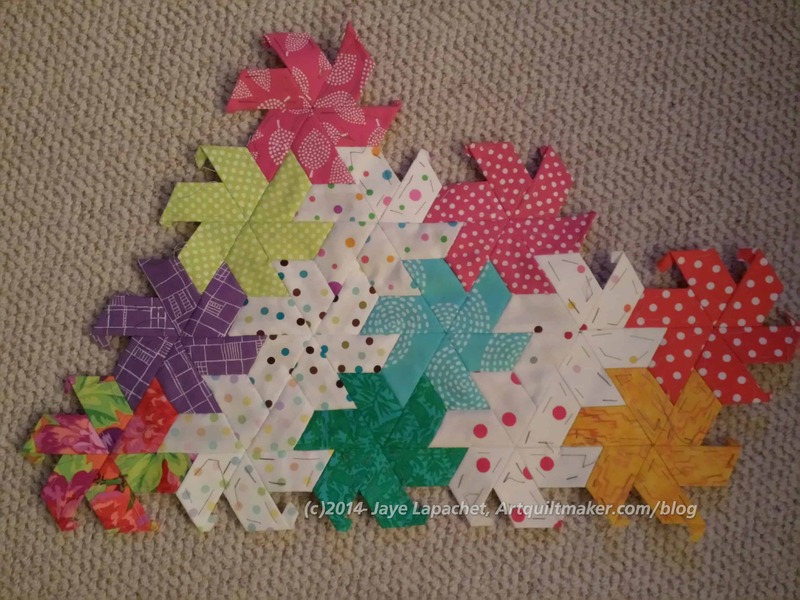 I am linking up with Judy Laquidera at the Patchwork Times. I finally took a little time to finish the larger piece. I had sewn two sides of the yellow and red star segment onto the larger piece, but I hadn’t finished sewing the rest of the sides of the two piece segment onto the larger piece. The folded over bits waiting to be sewn finally started to bug me. I took some time on Friday night to stitch the last remaining sides. I have been thinking about birds on and off for the past couple of weeks. I watch birds out my window when I eat breakfast and there are a few different ones that like to eat the berries on a bush in my yard. I have been drawing wings and little fat birds in my journal. In the past few days I have specifically been thinking of peacocks. I do not actually like peacocks IRL very much. There are peacocks that stroll around our local zoo screeching and making a big mess. I do like to look at them in art, though. 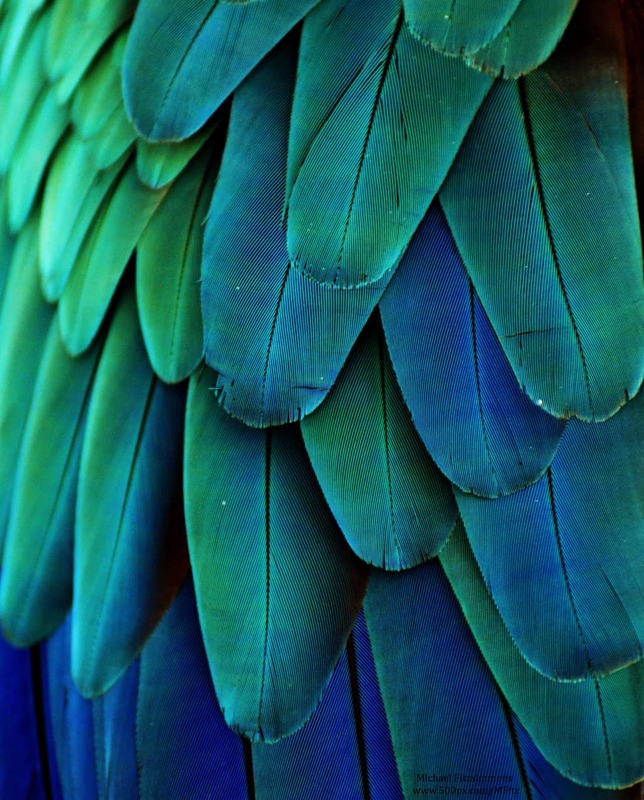 While the feathers to the left are from a Macaw, the colors remind me of peacock feathers. The photo is a little dark for me, but there is something about it. 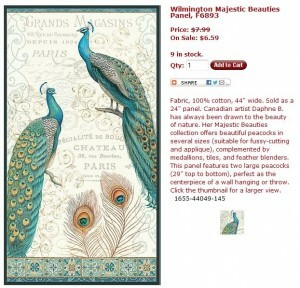 I also saw the Majestic Beauties fabric by Wilmington Prints at the recent quilt show. I was thinking that using the peacock panels might be a good way to use peacock fabric. I am hesitating because the colors are beautiful, but the fabric has a lot of beige in it and is not bright and cheerful. Still there are some companion prints that don’t have as much beige that might work. 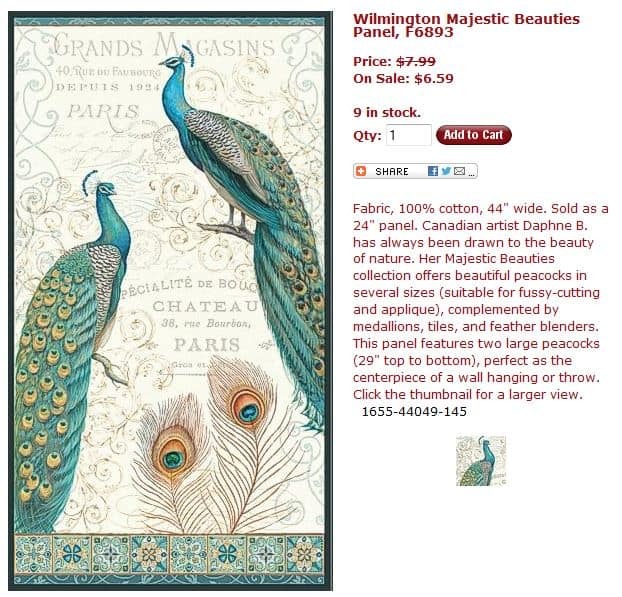 On the other hand the letters on the background of the Majestic Beauties fabric panel might make interesting motifs when put together in the One Block Wonder method. I really just want to try the technique that Pam used, so perhaps I have enough repeats of a Philip Jacobs fabric to try it out without having to buy new fabric. 2015 film: The Lobster is an upcoming romantic science fiction thriller film directed by Greek director Yorgos Lanthimos in his English-language debut. The Maine Shrine Lobster Bowl Classic, played each summer at the end of July is in its 26th consecutive year with Lobster Bowl XXVI. California Department of Fish and Wildlife, Marine Region, Spiny Lobster Fishery Management Plan. Boston Lobsters Tennis Center at the Manchester Athletic Club.